← Check out our new “grow the guide” and “add an eatery” pages! We ate in the biggest space in the school, the auditorium, on long tables with benches that could be folded in half and shoved onto one side for large meetings (when the 320 students would sit on the floor). We did not have a kitchen. The food arrived in big tubs, warmed in metal closets on wheels, served onto paper plates that would be thrown away at the end of breakfast and lunch. I had voted to join the 80% of our students on the subsidized federal meal plan by paying very little (perhaps $60/month?) to eat the same food. Lunch varied: macaroni and cheese, meat and rice, meat and vegetables, etc. After the first two weeks of serving myself two chunks of nameless meat covered in brown sauce from one tub and perfect orange and white vegetable cubes from another I asked to be given the vegetarian option. Tofu replaced the nameless meat, same sauce. It was edible, mostly monochromatic; none of it was inspiring. “Fair enough, but you can’t eat this. You are having my sandwich.” I marched up to the teacher table, grabbed my sandwich – a testament to my second year energy: whole grain bread, almond butter, and boysenberry jam. I walked over and handed it to the child. “You can’t eat those for lunch, we have a test this afternoon, how are you supposed on concentrate on sugar? I will give these back to you at the end of the day so you can take them home.” I took the offending bags and marched back to the teachers’ table. “I have nuts and an apple at my desk,” I retorted, suddenly feeling unsure and silly. Sure enough when I peered over at the tables, my sandwich sat untouched, serene in its neglected glory, taunting my idealism. Our school was in the second story of a rented building in downtown Washington. There was no outside recess. We would take field trips to our closest playground, a 6-block walk under a highway. We had summer school, school on Saturdays, and I received a cell phone where students and parents could call me at all times. 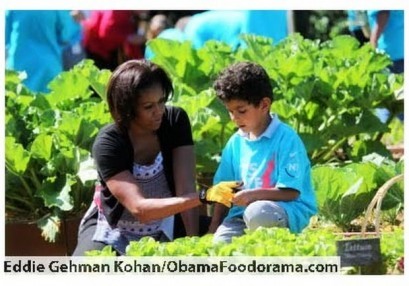 First Lady Michelle Obama's Let's Move Campaign is one of the many spotlights shining down on food in schools. I am thrilled to report, as you probably well know, that in the last 10 years there has been a cosmic shift. In some areas of the country I feel one is tripping over squash vines or the latest greenhouse effort to get to the front door in time for class to begin. Whether driven by concerns about obesity rates, soda in school, or feeding gray cells – concerted efforts are being made to bring a kitchen with fresh food back into the schoolhouse. Though often food service providers have contractual limits to how much food can be supplied by outside sources. People are working to max out and push against that 10-15% limit, bringing more farm fresh food to feed our future leaders. This October is our first National Farm to School month – government organizations, nonprofits, chefs, and farmers are all working to highlight this important issue. Take some time to browse around the Farm to School site, it has a list of regional as well as local initiatives you can become involved in. Do you want to donate your time? Do you feel like dressing up as a carrot and talking about the importance of soil? 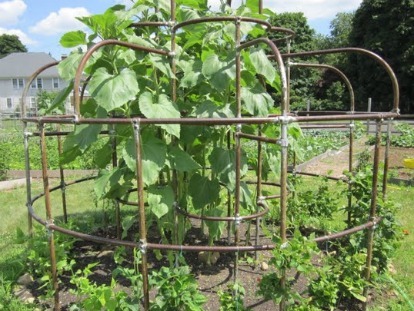 Do you have sunflowers you could bring in to a classroom and have the kids shuck the seeds? Real Time Farms is working with several schools to highlight and share the stories of the farm fresh ingredients being served. The software we have been using with restaurants nationwide can easily be used with schools as well. One of our many dreams is to help consumers: parents, teachers, and students follow their food from plate to farm, tracing meals in dormatories and K-12 schools nationwide. Working with Food System Economic Partnership (FSEP), our own regional program (findable in the Farm to School database), we are using our software to highlight what the Ann Arbor Public Schools are serving in their lunch rooms. Over the past few years, FSEP and other Farm to School partners have worked hard to get the local produce of Ruhlig Farms and Horkey Brothers farm into the public school system. The program’s reach has been expanding, from one local food item per week to a fresh local fruit or vegetable three days a week in the months of September and October. See what they are doing on Real Time Farms! My scalding food memory will always be part of me, but I am happy to report that many people are working together to change “what he will eat.” Working together, we can change what our children are eating. This entry was posted in On the Playground (kids) and tagged Corinna Borden, farm to school, Farm to School Month, Food in Schools, FSEP, Real Time Farms, School Lunch. Bookmark the permalink.